Obama’s proposed climate change agreement:Good for the planet and perfectly legal. Obama’s proposed climate change agreement would be good for the planet and perfectly legal. 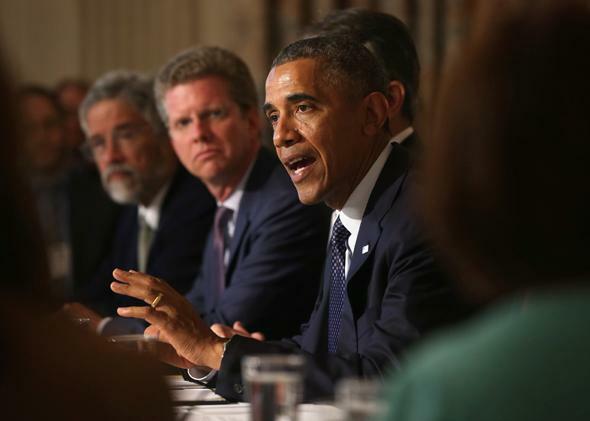 President Obama speaks about climate change at the White House on July 16, 2014, in Washington. President Obama “is working to forge a sweeping international climate change agreement” but “without ratification from Congress,” the New York Times reports. Yet the U.S. Constitution provides that two-thirds of the Senate must consent to an agreement in order for it to be a valid treaty. So the Times reports that Obama’s goal is a “hybrid agreement” that blends “legally binding conditions from an existing 1992 treaty with new voluntary pledges.” Somehow, countries would be legally required to make emission cuts that would also be voluntary. Not a treaty, but a treaty-ish. The political reaction is predictable. Senate Minority Leader Mitch McConnell told the Times that Obama once again is circumventing Congress. From the right, the new proposal fits a pattern of “domestic Caesarism”—using executive power to implement policies rejected by Congress. The complaint is sweeping, from this proposal about climate regulation to health care and immigration enforcement. By contrast, Harvard professor Jack Goldsmith points out that the president cannot enter a treaty on his own. He can make agreements with foreign leaders until he is blue in the face, but those agreements can’t force a reduction in U.S. emissions unless Congress passes a law saying so. Goldsmith sees the president’s action as symbolic, a way to stake out a legacy and inspire his base. So which is it, gauzy PR or yet another step toward dictatorship? In fact, the president is acting rightly and well within his legal authority. Rightly, because only international cooperation can stop climate change. Legally, because the president enjoys the authority to make unilateral agreements with foreign leaders. The president cannot make a treaty on his own, but he is free to enter agreements with foreign countries pursuant to his foreign affairs powers. These agreements are called political agreements, or gentlemen’s agreements, or nonbinding agreements, or joint statements. They do not legally bind Congress to pass laws or Americans to change their behavior. You won’t have to shut down your coal-fired power plants or trade in your Hummer for a Prius on the president’s say-so. Nonetheless, agreements like this one can be of great significance. Perhaps the most famous example is the Helsinki Accords of 1975. This agreement provided that the United States and a number of European countries would recognize the territorial boundaries of the Soviet Union, that the Soviet bloc would respect human rights, and that the nations would attempt to resolve their disputes peacefully. Although controversial at the time, historians now believe that the accords reduced Cold War tensions while providing dissidents in communist states a lever for criticizing their governments. No one regarded Helsinki as a treaty. President Gerald Ford did not submit the text to the Senate even though some senators complained, then as now, that the Senate was being circumvented. Also then as now, Senate confirmation was not needed. Congress could have passed laws that violated the accords without also violating international law. The United States would have looked bad, but looking bad is not a violation of the law. There are other examples of such agreements, including the pacts that normalized relations between the United States and China in the 1970s, without the participation of the Senate or Congress. Some presidential agreements can even limit the rights of Americans. The Roosevelt administration settled claims with the Soviet Union in 1933, while the Carter administration settled claims with Iran in 1981. Both times, the presidents limited the contractual and property rights of U.S. citizens, with later backing by the courts. Most agreements made between the U.S. government and other countries are not treaties that the Senate has enacted, but agreements between leaders, or between other officials in the executive branch of the government—some of which are formally “legal,” while others are “political” or otherwise not legally binding. Obama apparently hopes the proposed climate agreement will lead the United States and major emitters—above all, China—to limit greenhouse gas emissions over time. Defending pre-existing climate regulations in court, Obama (and future presidents) could argue that the international agreement helps justify them. It would not be an independent source of legal authority, but it could bolster the case for a president to use his or her discretion to reduce emissions where statutes allow the executive to act in the public interest. Consider that unilateral climate regulation here will have little effect on climate change—and it is a vulnerability, for defending it in court, that the president can’t really show that such rules will make Americans better off. By citing an international agreement, by contrast, government lawyers may be able to convince courts that our regulations will in fact accomplish something, by inspiring reciprocal action by foreign governments. Wouldn’t courts disregard the agreement as empty, since it’s nonbinding? That depends on how countries treat it. If foreign countries cut their own emissions based on such a compact, that would be impressive evidence that the agreement means something. And there is a good reason to believe that indeed it will. The agreement is being negotiated only among major economies, outside the U.N. framework that has structured negotiations so far. That matters because the U.N. framework gives poor countries a voice, and hence a means for extracting aid in return for their consent to a climate treaty. As I’ve explained, you can have either climate justice (meaning compensation for poor countries hardest hit by climate change) or a climate treaty—not both. If big countries are prepared to take the political heat from excluding poor countries from negotiations, it means they are ready for a deal. An international agreement might also help President Obama or a future president win stricter climate laws from Congress. One objection to the 2009 bill, along these lines, which passed the House but died in the Senate, was that it imposed burdens on U.S. energy producers without requiring emission cuts by China and other foreign countries. Next time a bill makes headway in Congress, this objection will fade if foreign countries are complying with the Obama agreement by shutting their own power plants. If the proposed agreement has clout, doesn’t this show that the Brutus club is right that the president has circumvented Congress? Maybe so, but not in a way that violates the Constitution or our legal norms. If the president calls Congress a bunch of knuckleheads, and the public believes him, he may weaken its power, but he does not violate the Constitution. It may turn out that President Obama has simply outmaneuvered Republicans in Congress by entering an agreement that lacks the power of a treaty, but causes other countries to change their behavior—resulting in new forms of international cooperation that subsequent presidents and even Congresses will respect. That would be entirely within the rules of the game.